Exclusive: Autographed by the author! Master digital tools. Book cheap flights online, find rooms at AirBnB, and catch a ride with Uber. Follow three-day plans to explore each city. Learn which cities match your interests and which can be easily combined for a longer trip. See iconic sights. 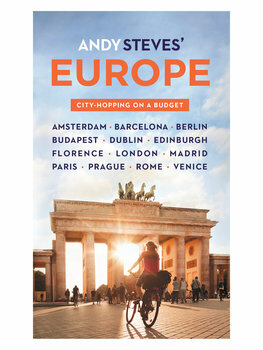 Check the Eiffel Tower, the London Eye, and the Colosseum off your bucket list — and use Andy's tips to save time and skip lines. Hit the local hot spots. Chill at Amsterdam's coffeeshops, study mixology at London's speakeasies, and bust moves at Barcelona's beach clubs. Enjoy the best — and cheapest — local cuisine. Graze at crêperies in Paris, pubs in Dublin, and aperitivo in Rome. Become a temporary local. Adapt to the culture to enjoy authentic, unforgettable experiences. Dimensions: 7 ½" x 4 ½" x ¾""